Lane spotted this at the art school in my very own university. 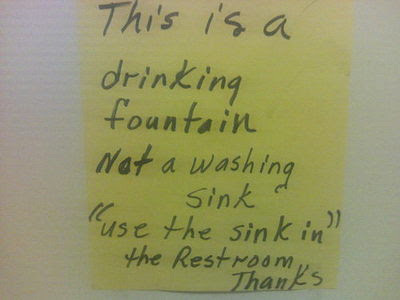 I assume that the writer had never heard somebody say "use the sink in" before recently and felt they needed to indicate that it was not their phrase. The rest, though, they own that. Good find. Now I want to hear the story that lead to this sign. Ewww...washing your hands in a drinking fountain?? Did they bring their own soap?